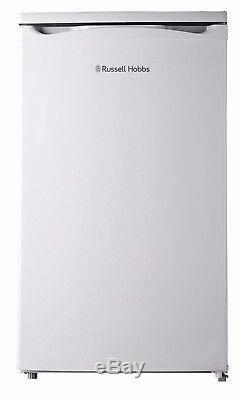 Russell Hobbs RHUCLF2W 50cm Wide White Under Counter Larder Fridge. GRADE A+ - This product has been checked, tested and graded A+ by our team of experts. A Grade A+ indicates that this product is fully functional, is in excellent condition, is unused, and complete with all original accessories. The reason for this grading is that it may have only the slightest of minor hair-line scratches on the appliance (if any at all). There will be NO damage to the front/door, sides or top of the appliance. The packaging may be damaged. GRADE A - This product has been checked, tested and graded A by our team of experts. A Grade A indicates that this product is fully functional, is in very good condition, is unused and complete with all original accessories. It may have very minor cosmetic damage such as small scratches or dents on the sides, back or top of the appliance. There will be NO damage to the front/door of the appliance. GRADE B - This product has been checked, tested and graded B by our team of experts. A Grade B indicates that the product is fully functional, is in good condition, is unused and complete with all original accessories. There will be cosmetic damage or dents to either the sides, back or top of the appliance. There may also be small scratches or smaller dents to the front of the appliance. The appliance is still in good working condition and the only issue is the cosmetic damage. GRADE C - This product has been checked, tested, cleaned and graded C by our team of experts. A Grade C indicates that this product is fully functional, is in good condition, is unused and complete with accessories. There will be cosmetic damage to the appliance and this may include larger dents to either the front/doors, sides, top or back of the appliance. The appliance is still in a fully working condition but WILL have cosmetic damage. 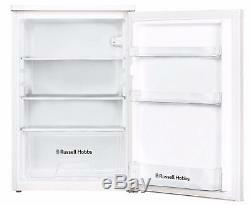 This white Russell Hobbs under counter fridge is perfect if you're in need of extra cold storage but are tight on space. With its compact size, and modern white design, this under counter fridge can fit neatly under your kitchen counter. The RHUCLF2W under counter fridge has an impressive 112 litre capacity. This white fridge has removable shelves which therefore gives you the option of extra space to stand tall objects, or to split the unit into different levels, with storage available in a drawer, on three shelves, or on the door shelves. This 112 litre under counter fridge is rated an impressive A+ for energy efficiency, being sure to keep energy bills down whilst adding extra refrigerator space in your home. 3 removable shelves (2 adjustable). Product dimensions (CMs): (H)84.5 x (W)50.1 x (D)54.0. You must have a valid mobile number on your account! You will be able to choose a day that suits you, and also add extra services such as installation and removal for an additional charge. This will take you straight to your order and allow you to choose a suitable date. 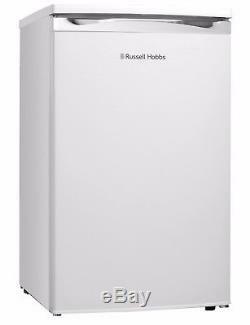 The item "Russell Hobbs RHUCLF2W 50cm Wide White Under Counter Larder Fridge" is in sale since Friday, November 3, 2017. This item is in the category "Home, Furniture & DIY\Appliances\Fridges & Freezers\Fridge Freezers".